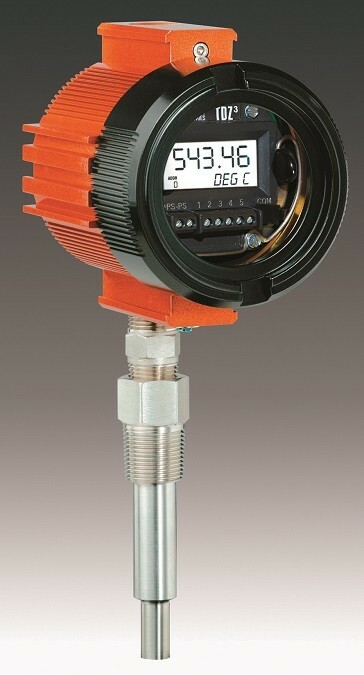 A TDZ3 temperature transmitter can provide a good system option. Some processes do not require temperature measurement accuracy, and others do. However, you may be unsure whether accuracy is important for your particular application, or whether improving accuracy will make enough of a difference in your process results to justify the cost and effort. This article identifies problems that result from inaccurate measurements and outlines ways to solve them that are both effective and economical. Those which do not require accuracy. You simply need to know if the temperature is stable or going up or going down. Those which do require accuracy. Strategies in this article will help with those measurements. Those where there is uncertainty about the accuracy requirement. If the measurements in this category are on a Preventive Maintenance schedule for calibration or verification you may want to take steps to improve accuracy. The same steps we take to achieve higher accuracy also result in reduced drift and that would have a positive impact on your maintenance frequency. Improving accuracy and reducing measurement drift are often related and can have measureable results. There are a number of steps involved in selecting the best sensor for the application, reducing errors caused by external environment or caused by lead wires, and reducing measurement errors. There are times when the temperature sensor is selected based on convenience, what is on the shelf or the “plant standard.” It is not uncommon to see a Type J or K thermocouple measuring a temperature that should be measured with a Platinum RTD (resistance thermometer). Many process engineers and technicians prefer RTDs. Selecting the best sensor for the application greatly affects the accuracy of the measurement and an RTD is the most accurate sensor to use when the process temperature is within its measuring range. But you will need to use less accurate thermocouples when you need to measure temperatures that are hotter than the RTD’s upper measuring limits. In these instances you will want to take specific steps with thermocouples to improve the accuracy of the measurement results. You can improve sensor accuracy by using thermocouples constructed with Special Tolerance (also called Premium Grade) wire. The reduced error is achieved by using wire with higher purity alloys. At 500 degrees F (260 degrees C), the uncertainty of a Special Tolerance thermocouple is about ±2.0 degrees F (1.1 degrees C). Sensor selection is very important to measurement accuracy. As stated above, a Class A Pt RTD uncertainty is about ±1.2 degrees F (±0.67 degrees C) at the same operating temperature. To simplify the process of choosing a sensor, you can operate from the assumption that changing from a Standard Grade thermocouple to a Premium Grade thermocouple cuts the error rate in half; changing from a Premium Grade thermocouple to a Class A RTD cuts the error in half again. Thermocouples wired back to a PLC or DCS must use thermocouple extension wire. Unfortunately the extension wire is yet another source of measurement error. Using standard grade J or K extension wire also adds another ±4 degrees F (±2.2 degrees C) error. You can cut the error rate by using premium grade extension wire, which has half the error rate of standard extension wire, just as with premium thermocouples. (These error figures are only true when the wire is new and “pure.”) Over time the error gets worse as the wire gets contaminated from the atmosphere in your plant and the wire is exposed to temperatures greater than or lower than the wire tolerances. There are many instances where contamination causes even more “drift” than the original uncertainty of new thermocouple wire. If the uncertainty caused by thermocouples was a fixed offset, we could simply calibrate it out and be done with it. But when the error is in the form of drift that changes over time, calibration becomes a Preventive Maintenance program that few want to take on. Most plants prefer to avoid that extra labour whenever possible. How do you solve these problems? Start by determining how much error is caused by the thermocouple extension wire. Most people overlook this option until Plant Operations declares there is a problem or a catastrophic measurement failure occurs. We all know thermocouples fail, but it is easy to forget that thermocouple extension wire also fails. When it does, it has to be replaced. If you replace the extension wire with new extension wire, you perpetuate the same problems by reintroducing the error and drift it causes. You may have to live with thermocouples, but you don’t have to live with thermocouple extension wire – you can replace it with other solutions. Two options for replacing thermocouple extension wire are temperature transmitters and remote I/O hardware. Both use copper wire to transport their signals back to the control system. Unlike thermocouple extension wire, you can expect the copper to last the life of the plant. Modern I/O products have performance characteristics similar to transmitters and can save a lot of money. You still need short sections of extension wire when you use these transmitters or I/O products. Use special grade thermocouple wire instead of standard extension wire in these cases to further minimize the error. Copper wire is used for RTD lead wires. If you are familiar with 3-wire RTDs you know one lead is called the compensating lead. Between copper and a compensating lead you might believe that RTD lead wire does not contribute to the measurement error. Unfortunately, this is not true. Copper wire can cause significant error in an RTD measurement because RTDs are resistors and copper wire is resistance. There are many contaminants in a typical process plant that cause corrosion and this corrosion changes the resistance of the copper lead wires. This resistance change in the lead wire can cause error. To eliminate lead wire error the solution is to use 4-wire RTDs. Here is why: When a third lead wire is added to the RTD, the measurement is made with today’s electronics by taking two voltage measurements. The important thing to remember is that these are high impedance voltage measurements. For all practical purposes, there is no current flow through that third lead. V1 gives the value of the lead wire resistance R1. V2 gives the value of the RTD + R4 lead resistance. Subtract V1 from V2 and as long as the lead resistances R1 = R4, only the value of the RTD remains. This is an accurate measurement. Realize that too many things work against making R1 and R4 identical when accuracy is your primary concern. Wire gauge intolerance and work hardening varies the resistance. Even if no human error takes place during installation, corrosion constantly works against the measurement and is the main reason R1 never equals R4. So what happens if the lead’s resistances are not equal? If the resistance imbalance is as little as 1 ohm, a 100Ω Pt RTD has an error of about ±4.7 degrees F (±2.6 degrees C). If you are trying to achieve a ±1 degrees F (.55 degrees C) measurement accuracy, this corrosion is standing between you and success. You can spend your life calibrating this error out or eliminate the error totally with a 4-wire RTD. When using 4-wire RTDs, for all practical purposes, there is no error caused by the lead wire. 4-wire RTDs can have a lead wire of any length and the leads can undergo constant resistance change and still cause no measurement error. It is still important to ensure your total resistance does not exceed the drive capacity of your constant current source. Typically modern day temperature transmitters offer enough current drive to support RTD circuits that have up to 3-4K ohms of total resistance. With lead wire error eliminated you are able to focus on the sensor and measuring device to further reduce error. The only reasonable objection to using the 4-Wire RTD is that the existing legacy input card only accepts 3-wire RTDs. This is old technology and should be considered for replacement. There is another option to consider if you are not able to use 4-wire RTDs: switch from 100Ω Pt RTDs to 1000Ω Pt RTDs. Ω of resistance imbalance in the current carrying legs of a 100Ω Pt element produces about ±4.7 degrees F (±2.6 degrees C) error. If you change to a 1000Ω sensor that same 1Ω of imbalance will have one-tenth of the effect. The 1Ω of imbalance error drops to about ±0.47 degrees F (±0.26 degrees C). While the use of the 1000Ω 3-wire RTD is a big improvement over the use of a 100Ω 3-wire RTD, it is not a panacea. When the lead wire resistance imbalance changes, that causes the measurement accuracy to change. That means you still need a calibration program to temporarily eliminate the error. The 4-wire RTD is still the single best solution because it removes all lead wire error and eliminates the need to calibrate due to the inevitable corrosion. VFDs, motors and radios create “normal” levels of EMI and RFI which can cause errors on temperature measurements. Thermocouple and RTD signals are very low level mV signals. It does not take much noise to cause significant distortion of the measurements. If you are wiring these low level signals back to the control system please use best practices to keep noise off these signal wires by using drain wires, proper grounding and physical separation. A better solution is to convert the low level signals to high level signals as close to the temperature sensor as possible. The same amount of noise will affect high signals less than low level signals. Signals like 4-20mA, HART or RS-485 survive most typical levels of noise. If you are pursuing the very highest accuracy, you have to deal with the final “as built” error in the RTD. The transmitter can be used to calibrate out that final offset error and match you to the ideal curve. Such a process delivers a typical transmitter and sensor combined accuracy of less than 0.05 percent of span. 2. At the control system, an A/D error occurs when turning the signal back to digital Using the HART digital signal is one way to avoid the conversion errors. MODBUS Serial or MODBUS over Ethernet is another option to keep the measured value digital. Temperature sensors often require signal boosts for effective transmission.